Hello all! A very special friend of mine has her birthday coming up soon and so naturally I wanted to create a card for her. I wanted it to be bright and cheerful so I went with balloons and adorable little critters from Simon. The idea was to create a balloon background and to make it look like the bunny is holding all of the balloons. I didn’t want to add strings to every image, so I only stamped one right next to my watercolored bunny so that he is only holding one balloon and the rest are just floating in the air. I often struggle with coloring and tend to over do it (especially with alcohol markers), but I seem to have much more success when using watercolors. 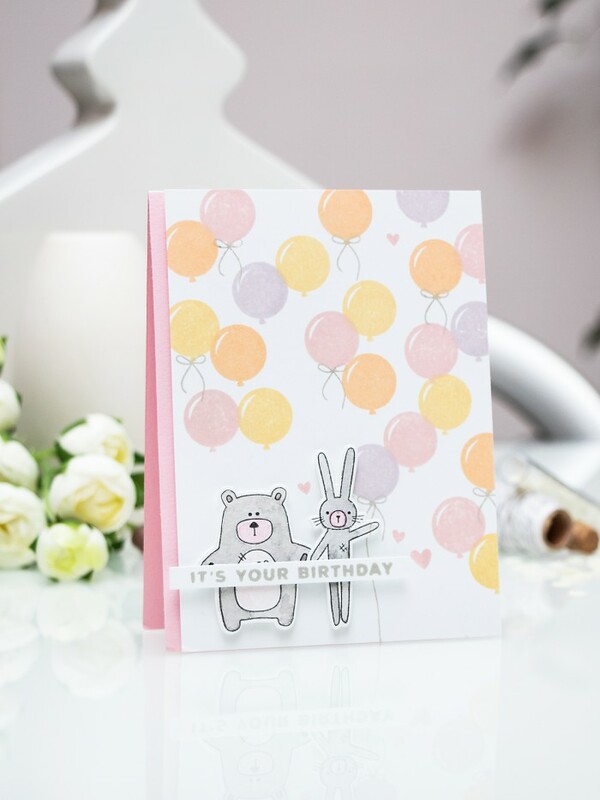 The little bear and bunny were stamped using Simon’s new Intense Black inkpad onto watercolor paper and quickly colored using light grey and pink watercolors from my Kuretake Gansai Tambi set. I also die cut them using matching dies and stamped a It’s Your Day sentiment onto a strip of white cardstock to sort of have them hold it. 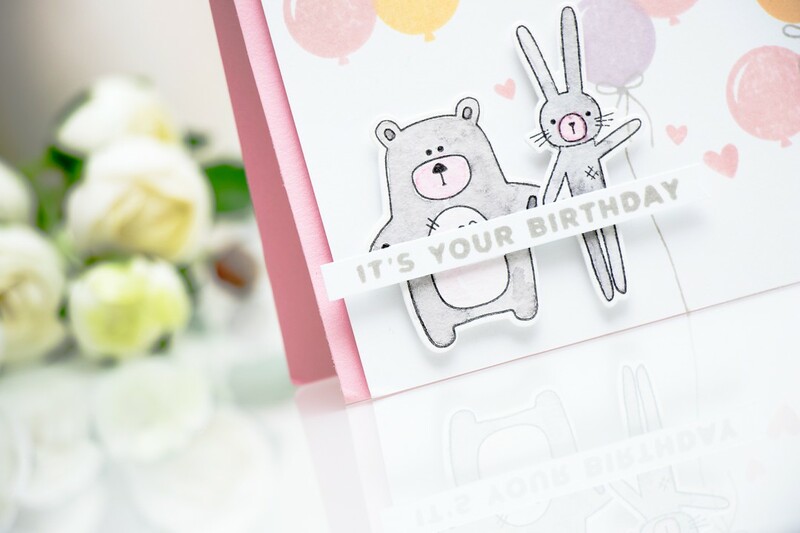 The background was done using a one small balloon stamp from the Big Birthday Wishes stamp set and stamped using a few colors of ink – Duckling, Twirling Tutu, Melon and Thistle. I also added little bows and a couple hearts from the Birthday Bits set to this background. 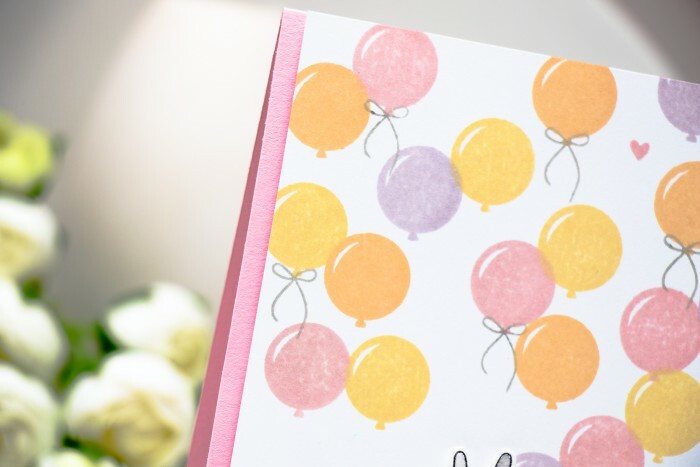 Balloons make a great background stamp for celebrations. Now, I’m trying to think of other things that will work and use my stamps more. Thanks..
Beautiful card! I love those colors. I also like your new avatar picture. Very pretty! That is wonderful Yana. I am sure your friend will love it. You can never go wrong with balloons for a birthday! So pretty, and the colors are delightful 🙂 Love how some have sweet little bows!